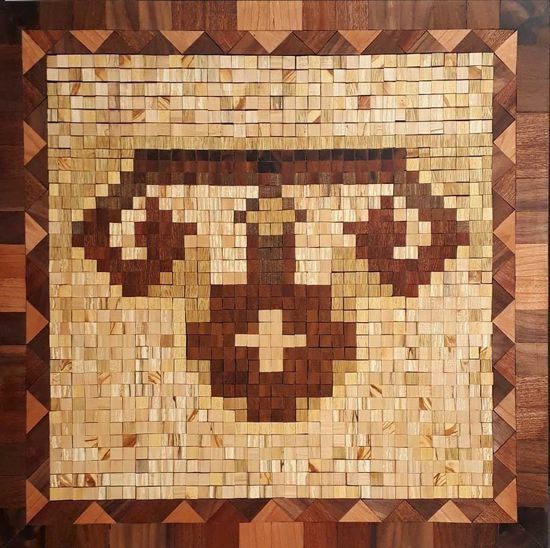 Wood Wall Art Panel with Kilim Motif "Ram's Horn". 3D Wall Art for your Living Room as a Rustic Home Decor. An Original Artwork for You. Ram’s Horn is a symbol of fertility, good luck, fortune, happiness, long life, heroism, and power. The Ram’s horn motif embody productivity, efficiency, heroism, and power of men. It is mostly used in Anatolian Culture with Hand on Hips motif. Horn symbol has always represented power in Anatolia. Ram’s Horn has been identified with the men who were portrayed as the symbol of power in human history. Horn motif is stylized like spiral or crescent by using the shape of ram from different aspects. Ram’s Horn motif is made up of 1408 separate pieces of wood as a mosaic. There are 15 different types of wood: Cherry, Sapelli, Iroko, Walnut, Walnut Rootball, Afrormosia, Spalted Linden, Obeche, Mable, Limba, Mahogany, Doussie, Alder, Chestnut, Olive. They are glued together on an MDF panel.